I first found Laloli, at Grimburgwal 13, in Amsterdam, last year, when I was looking for something nice for my wife. I bought her a beautiful little enamel brouch, a tiger or a monkey. Anyway, she loved it and then she lost it, so, I was under orders to get her a replacement when I was there yesterday. All they had left was a turtle covered in hearts. Monique, if you read this, she loves this one too. Marianne, you'll have to let me know what other animals you make, since you've got a fan, over here. 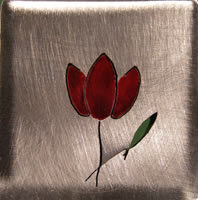 I also bought a tulip brouch, like the one in the image (Copyright Laloli), but taller and thinner. They lots of other stuff too, including some wonderful gold earings. Maybe, next time.